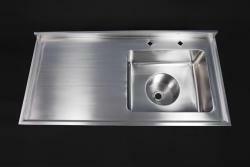 Our plaster sinks are fabricated from the same high-quality, 304-grade steel we use for all our healthcare products. This steel is naturally antibacterial, helping you to maintain an ultra-hygienic environment within your hospital or other healthcare practice. It is also the strongest material available – and the most durable, making it the long-term, cost-effective choice. 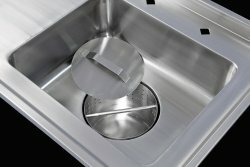 Our plaster sinks feature a dedicated bowl with integral sump and removable drainer basket, designed to collect loose plaster solids and prevent them from entering the waste pipes. This makes them ideal, not only for cast preparation, but also for any process which involves the deployment of solid materials which might otherwise block the drainage system. Handles on the lid and basket make removal and handling straightforward. 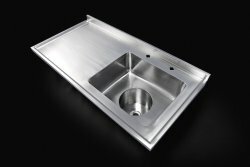 All of our plaster sinks are fully bespoke: you can specify the exact depth, width, length and shape of your sink unit. Whilst the bowl sump and basket are usually a standard size, these can also be altered, to meet your specifications. 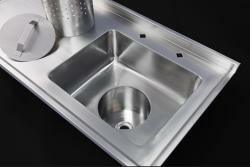 All of our sink units are fully welded; this seals all joins in which bacteria could otherwise breed. No other material offers this high level of finish. Our fully-bespoke plaster sinks are ideal for the soaking and preparation of casting materials – and, thanks to the integrated basket, they keep solid waste to a minimum. taps can be sited as per each client’s specifications. Our healthcare range includes many other useful items, from bench tops and hand-wash basins to wash troughs, sluices and slop hoppers. 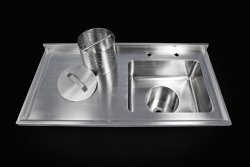 Call us today, to discuss how we can fabricate the products you require. In a busy veterinary practice, you need a plaster sink that will stand up to heavy usage. 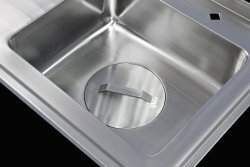 Our stainless-steel plaster sinks are made from robust 304-grade metal, which is impact-resistant and will last for decades. With an integrated sump, fitted with a removable perforated basket with lid, it is easy to prepare plaster casts – and to trap and remove all solid waste, to keep drainage clear. The basket and lid are fitted with handles, for ease of handling and removal. Each sink is bespoke: you can specify the exact length, width and shape of unit you require. You can also order the precise sump bowl and basket size to suit. With its smooth surface, stainless steel is the easiest material to keep clean. Its inbuilt antibacterial properties help to maintain an ultra-hygienic veterinary clinic, making our plaster sinks the obvious choice for your practice. any size or shape of unit and bowl, to fit your requirements. We make many other products for the veterinary sector – and can fabricate even single-item orders. Get in touch today.